I have many happy clients who have successfully made the transition from Clean 9 kick-start to the long term weight loss and fitness gain for Fit 1 / Fit 2. However, I also hear of many customers who don’t have such a happy time with Fit 1 – so I’ve decided to share my secrets of success. Everyone is different. 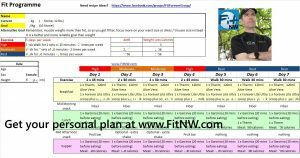 What a body builder needs to eat and how s/he needs to exercise over 30 days varies in comparison with a marathon runner. Likewise, a dad pushing kids around in buggies all week is going to have different needs from a mum who speands 5 or 6 days in the office. I give each of my clients a specific, bespoke and written down plan which they can pin to their kitchen cupboard or stick on teh firdge. The evidence of the plan is both a reminder and a prompter – so keep doing what needs to be done. If you are not a regular gym going – after 20, 40 or 60 years – then it is unlikely that you are suddenly going to become a gym monkey. Okay, you might start by going to the gym, but the chances are that you interest and commitment will soon wane. Right? Okay, so how about instead, we just look at your lifestyle and built a plan around that – around what is realistic and seek to make a few improvements ? Little things matter and over 30 days add up to be big things. Can you, for instance, take the stairs instead of the lift? Can you park your car at the far end of the care park away from the office or supermarket door – just so you have to walk further? And later, walk back again? Go through with you client what they spend on lunch, what they spend on snacks, coffee, cakes , treats and trips to the bar or pub? Now you have a basis for saying, how much of that are we doing to save over the next thirty days? and you should be surprised. When you do this you’ll find that Fit 1 will have a net cost of about £1 or US$1 per day – or possibly, it might costs nothing at all. Keeping in touch is really important – especially in the first 1 to 10 days. Make sure that the plan is working – and if not, adjust! I give my Fit 1 clients a 15% discount – because they are half way to buying wholesale! Once you add the discount in, then most people are saving money by buying the Fit 1 every week! Look, we all like to eat out – so give tips on how to do this well. Mine? Well, firstly, choose a restaurant with lots of healthy vegetables or vegetrain dishes – that weay, you have an alternative to the large steak, or at least can oder great vegetable tos to with it. Avoid the bread – but if you must, use olive oil and not butter. And, take the fruit option for desert. Latly, drink lots of water, it is great for you anwyway but wil belp slow the xonaumprion od qinw wrx. For some clients, I encourage them to double the amount of Garcinia that they take. For others, we talk about extra shakes . For some, the ProX bars are esential ofr others, not so. You don’t have to buy the Fit 1 box to follow and benefit from a Fit 1 programme. So, there are ways to save money further or to flex the products or product quantities to suit each person. If you would like me to design the perfect Fit 1 plan for you, then get in touch! Hi Sarah – I think it depends on your level of fitness and how well you are currently eating? If you have fallen into bad habits, then probably the best thing is to start with Clean 9 again. If not, then jump straight to Fit 1 or Fit 15?